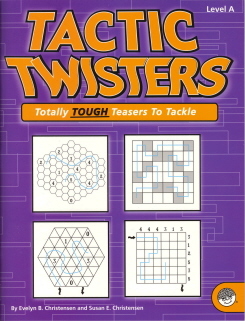 More than 140 maze-like puzzles in four styles to challenge and sharpen your problem solving skills--Honeycomb Loops, Gray'n' White Puzzles, Triangle Trails, and Grid Path Puzzles. Think logically as you twist, turn, bend and loop your way around to discover the correct paths. 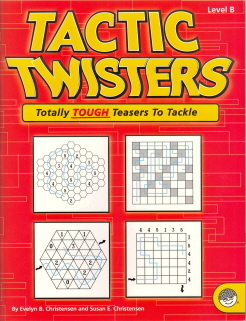 Tactic Twisters Level A and Tactic Twisters Level B. This book was co-authored with my daughter Susan, a terrific collaborator. We had a tight timeline with a New Year's deadline which made for a rather hectic Christmas vacation, but we're excited about the final product! Hope you have fun with it. "This book is dedicated to all our puzzling friends and to a God who always has an answer." "This book is dedicated to our wonderful family who's been such a help during this rough time and to a loving God who's always there for us."